The African Lime Butterfly is a common and widespread Swallowtail Butterfly that gets its common name from its favoured host plant but unlike most swallowtail butterflies, it does not have a prominent tail. It is also known as the Common Lime Swallowtail, Lemon Butterfly, Lime Swallowtail or Citrus Swallowtail. Apart from being tailless it has a wingspan 80–100 mm and above, the background colour is black. A broad, irregular yellow band is found on the wings above, which is broken in the case of the forewing and also has a large number of irregular spots on the wing. The upper hindwing has a red tornal spot with blue edging around it. 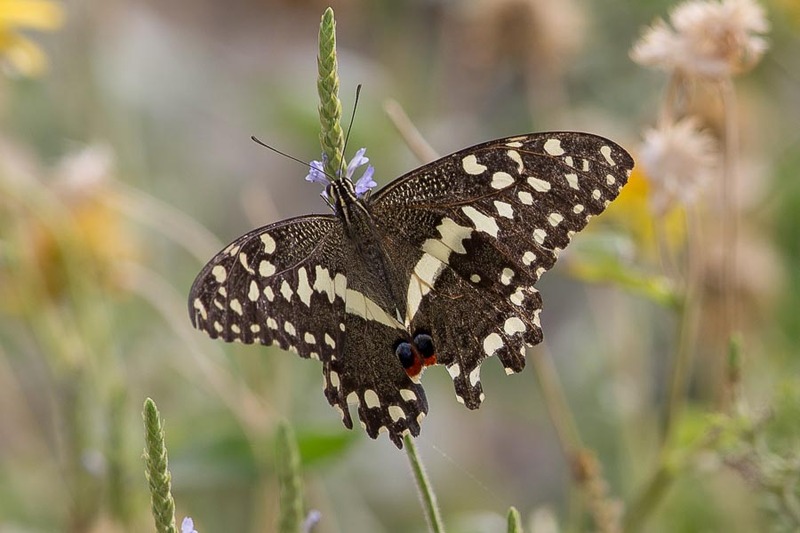 The Common Lime Swallowtail is perhaps the most widely distributed swallowtail in the world and can be found in Oman, United Arab Emirates, Saudi Arabia, Kuwait, Bahrain, Qatar eastwards to Austarlia and some Pacific Ocean Islands. The widespread range indicates the butterfly's tolerance and adaptation to diverse habitats where it is found in savannahs, fallow land, gardens, evergreen and semi-evergreen forests and shows a preference for stream and riverbeds.